Etalon plates are used in Fabry-Perot interferometers and come in to two basic types, air-spaced or solid. In an air-spaced system they comprise two very flat plates, coated to give high resolution in the spectral range of interest. 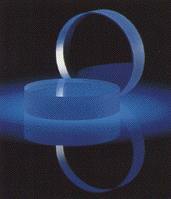 They are made to face each other while separated by an air gap, provided by spacers of identical length. Usually, the back face of each plate is wedged and AR coated to eliminate interferometric contribution from these surfaces. A solid Etalon is a simpler instrument; it is usually a fused silica substrate with very flat and parallel faces, with reflector coatings applied to the two faces. Optical Surfaces has built up a worldwide reputation for producing these super-flat components, supplying many customers in scientific institutes, observatories and industry. Optical Surfaces has supplied a set of 165mm Fabry-Perot Etalons, matched to L/150 to the Massachusetts Institute of Technology (MIT). The plates are the heart of the Millstone Hill Atmospheric science facility operated in cooperation with the University of Pittsburgh. The purpose of this instrument is to measure Doppler shifts in the atmosphere.